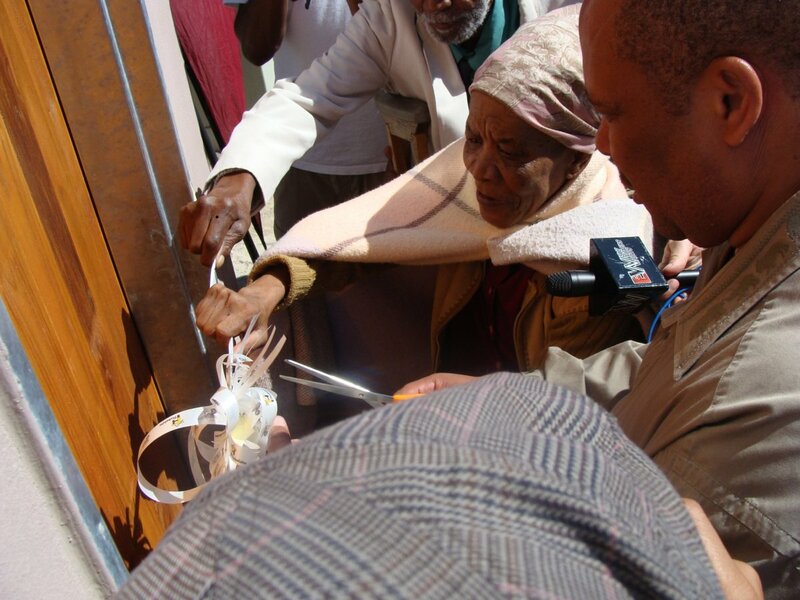 After living their entire married life of 54 years in a shack, an elderly Gugulethu couple, both 76, yesterday (31/03/2009) received the keys to their first proper house. It was a case of a dream come true for Sipho Mchana (76) and his wife Nomzamo (76) when they were one of 1,155 people to benefit from the handover of new houses built as part of the N2 Gateway Housing Project, a government housing initiative. The majority of the houses were handed over in Delft, but four beneficiaries, including the Mchana’s, received houses in Gugulethu. He said both of them were “happy and excited” while words could not describe how “blessed we are to be housing beneficiaries at this age”. The house was handed over to them by Western Cape Housing MEC Whitey Jacobs at a ceremony attended by Western Cape Premier Lynn Brown, Transport MEC Kholeka Mqulwana, and ANC secretary Mcebisi Skwatsha. National housing minister Lindiwe Sisulu, although expected at the event, never arrived. Mchana said he and his wife had met while they were at school and had been married for 54 years. He said both used walking sticks and were unable to walk long distances to fetch water and use the toilet. For the past five years he said they had been living in a tiny shack along the railway line between Gugulethu and Heideveld. Both depend on government’s monthly R960 social grant. Their new home has been fitted with furniture, kitchen appliances and a new bed by the housing department. Jacobs dismissed rumours that certain people were being given preference according to race when it came to allocating houses.